The holiday concert of the year, the iHeartRadio Jingle Ball 2016, kicked off on November 29 in Dallas and has been touring cities all across the country ever since. Here is everything you need to know about the talented The X Factor alum, Fifth Harmony, and their performance at the iHeartRadio Jingle Ball 2016. The 2016 iHeartRadio Jingle Ball tour is ringing in the holiday season with a bang, as popular singers like Ariana Grande, Justin Bieber, DNCE, Hailee Steinfeld, Rita Ora, Daya, and Tinashe take the stage as part of an extensive music concert series. Social media has been going into a frenzy with screaming fans posting videos from several artists’ spectacular performances. Those who missed Fifth Harmony live in action at the iHeartRadio Jingle Ball Tour needn’t be devastated! Heartbroken viewers who couldn’t make it to the concerts and missed last night’s (December 15) pre-recorded 90-minute special, a repeat telecast will air on December 26 at 8:00 p.m. EST on The CW. 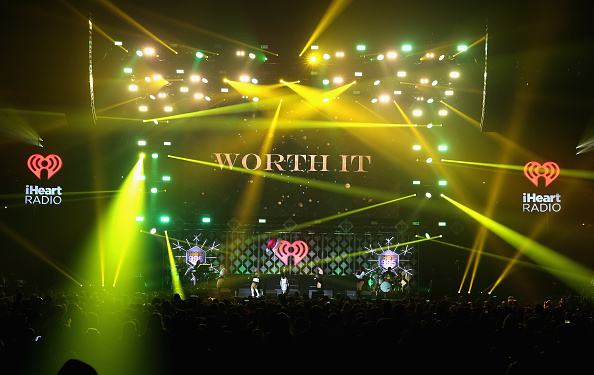 Keep reading to catch up on exciting updates and pics of Fifth Harmony’s performance at the 2016 iHeartRadio Jingle Ball right here! The all-American girl group consisting of Ally Brooke, Normani Kordei, Lauren Jauregui, Camila Cabello, and Dinah Jane have become a Billboard Hot 100 regular, after belting out chart-topping hits like “Worth It,” “Work from Home,” and “Boss.” Naturally, Fifth Harmony’s die-hard fans are desperate to catch all the action live and up close. The good news is that Fifth Harmony tickets are still on sale! Grab yours today as the Jingle Ball reaches its last three shows this weekend. So far, the iHeartRadio Jingle Ball concert tour has made several stops across the United States in cities like L.A., Minneapolis, San Francisco, Boston, Washington DC, Chicago, Atlanta, New York, and Philadelphia. While the holiday show is drawing to an end, there is still some time left to buy tickets to watch Fifth Harmony live at the Philips Arena in Atlanta, Georgia tonight (December 16). Fifth Harmony will be accompanied by artists like Meghan Trainor, Alessia Cara, Shawn Mendes, The Chainsmokers, and Lukas Graham. Click here to grab tickets for the final leg of the tour, which will head to sunny Florida on December 17th and 18th, before closing the curtains for the holiday season. If you missed the 2016 iHeartRadio Jingle Ball special last night (December 15), don’t worry, you can still catch it on The CW on Monday, December 26 at 8:00 p.m. EST!